Savvy travelers know that flexible points are some of the most valuable, because you can redeem them for award flights and hotels to travel for nearly free! But when you can’t find award flights or rooms, they’re even more handy to book paid travel with no blackout dates through a travel portal. Citi ThankYou points are no exception. If you have cards like the Citi ThankYou® Premier Card (which currently has its highest welcome bonus ever! ), you can easily redeem your points through the Citi ThankYou travel portal for flights, hotels, rental cars, cruises, and activities. There’s no fussing with award charts or searching for available dates, so it’s perfect for last-minute bookings or travel during peak times. You can apply for the Citi ThankYou Premier card here. Redeeming points through the Citi ThankYou portal is simple. I’ll walk you through the process step by step! Why Book Through the Citi ThankYou Travel Portal? With the Citi ThankYou Premier card, you’ll earn 60,000 Citi ThankYou points after spending $4,000 on purchases within the first 3 months of account opening. This is the best offer we’ve seen for this card! The points you earn are transferable, which gives you more flexibility by letting you access to Citi’s airline partners. Or, you can use the points to book travel through Citi’s ThankYou travel portal, where they’re worth 1.25 cents each towards flights, hotels, rental cars, and cruises. That means this sign-up bonus is worth – at a minimum – $750 (60,000 points X 1.25 cents per point). That’s a great deal, considering the $95 annual fee is waived the first 12 months! But you can only transfer points to Citi airline partners if you have a “premium” Citi ThankYou card, like the Citi ThankYou Premier, Citi Chairman (no longer available), or Citi Prestige (not currently available to new applicants). That said, award flights can sometimes be hard to come by, especially if you’re booking on short notice or traveling during popular times, like the holidays. That’s when booking through the Citi ThankYou travel portal can save the day! And you don’t need a premium Citi ThankYou card to use it. Plus, you’re not limited to booking flights. You can redeem your points for hotel stays (even at non-chain hotels), rental cars, cruises, and activities. How Much Are Your Thank You Points Worth? If you hold one of the Citi ‘premium’ credit cards, your points are automatically worth more when redeeming them for travel through the Citi Thank You Portal. And this increase in the value of your points can make paying a hefty annual fee worth it–depending on your personal credit card needs. For example, you can redeem Citi ThankYou points at a rate of 1.25 cents each towards airfare if you have the Citi ThankYou Premier, or Citi Prestige. And Citi ThankYou Premier cardholders also get a value of 1.25 cents per point towards hotels, rental cars, and cruises! Team member Jasmin booked the luxury Conrad Tokyo with Citi ThankYou points this way when they didn’t have any standard award rooms left! 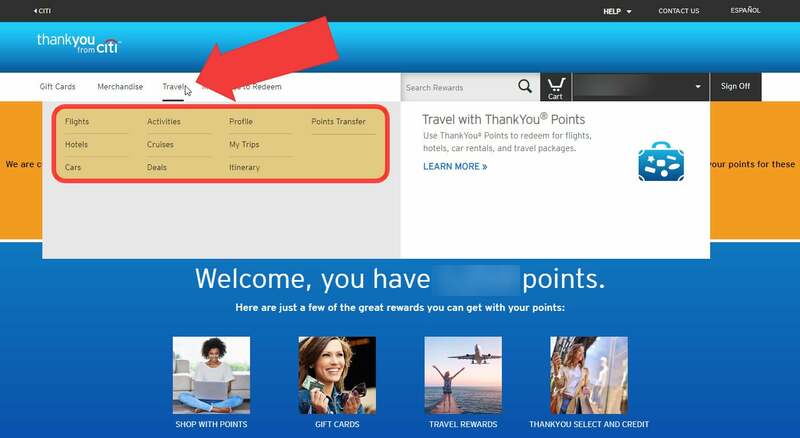 Redeeming your points through the Citi Thank You travel portal is fairly straightforward. The Citi ThankYou portal operates much like any other online travel agency website (like Expedia or Orbitz) and allows you to book flights, hotels, rental cars, cruises, and other activities. 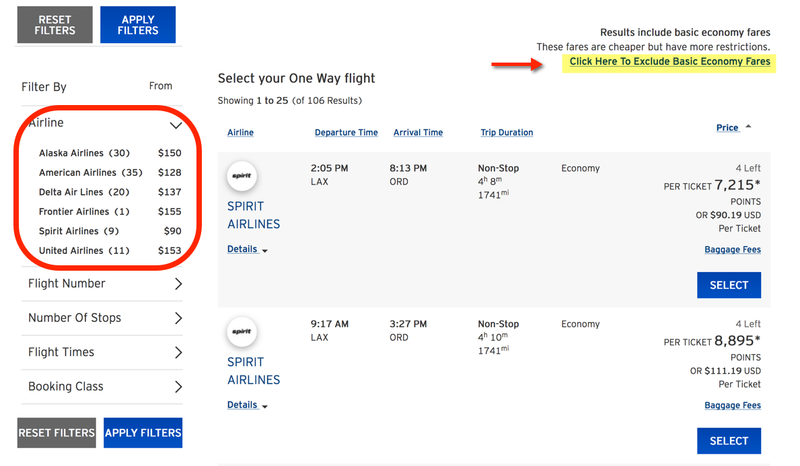 Keep in mind, you’ll still earn airline miles for flights when you book this way. But you will NOT earn hotel points or elite credits, because it’s considered a 3rd-party booking. And you may not have your elite status perks recognized (although team member Jasmin did receive Hilton Gold status perks at the Conrad Tokyo). To get started, log into your Citi account and navigate to the ThankYou travel portal from your Citi account homepage. Or visit directly at ThankYou.com using your Citi banking log-in. Personally, I prefer to go directly to ThankYou.com because it is the Citi ThankYou portal’s home screen and makes things a bit easier to navigate. Keep in mind that the ThankYou.com home screen is constantly changing to advertise new promotions or transfer partners, so check in often (and subscribe to our newsletter) to ensure you don’t miss out on any great deals or transfer bonuses. Note: ThankYou.com is currently under construction, but the general layout is still the same. Hover over “Travel” from the menu options along the top row. 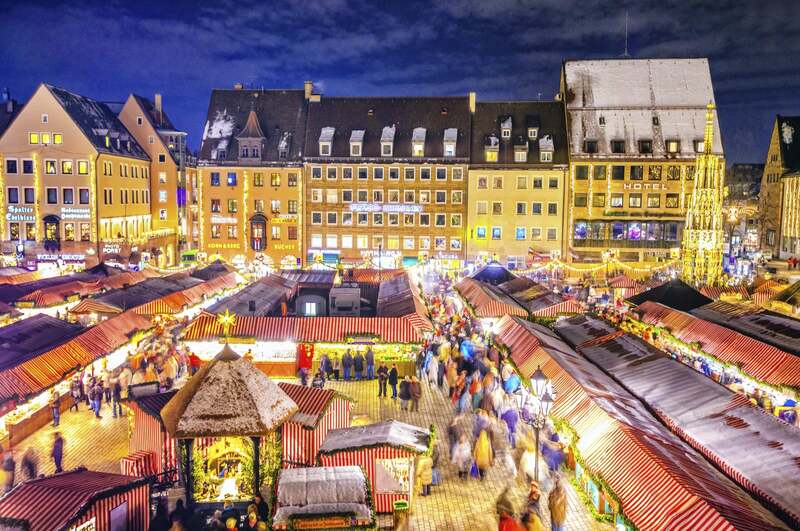 Then navigate to the section you want (flights, hotels, cars, activities, or cruises). After clicking on “Flights“, you’ll be taken to the Thank You portal booking engine. This operates much like other 3rd-party travel sites you might be familiar with. Here, you’ll enter your departure city, destination, travel dates, and number of passengers. 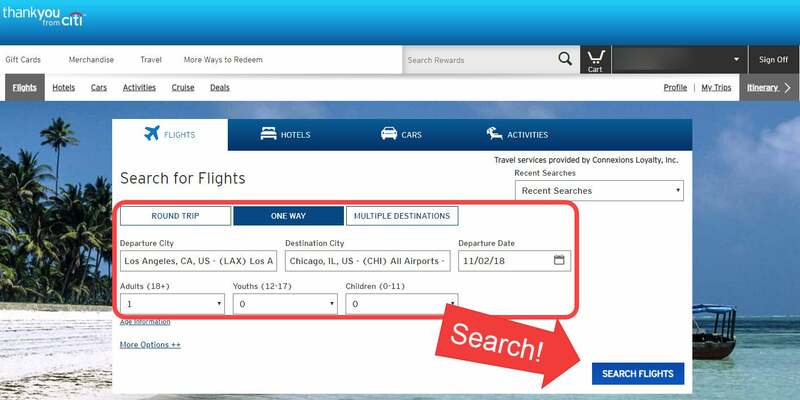 Then click “Search Flights” to view your results. The results page will automatically list flights in order of least expensive to most expensive. By default, it will include Basic Economy fares, but you can filter those out if you want. You can also filter by airline or stops (in case you want to avoid flying Spirit or another low cost airline). 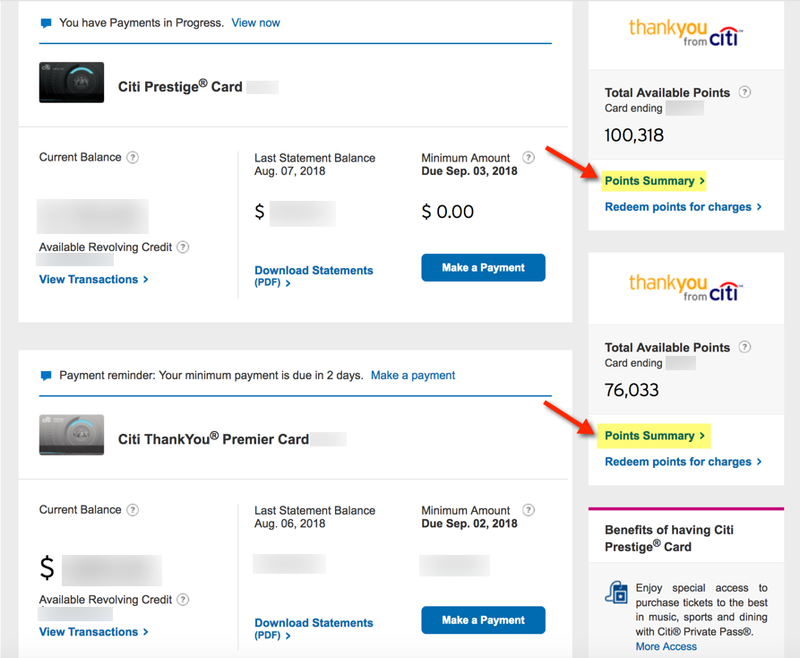 In the example below (using the Citi ThankYou Premier), points are worth 1.25 cents each towards airfare. On the right side of the screen, you can view the price for each available flight and how many Citi ThankYou points you’ll need to book it. To continue your booking, click “Select“. You’ll have an option choose if you want to use Citi ThankYou points to fully or partially pay for your flight. Then click “Add to Itinerary“. You’ll then be brought to a series of booking screens where you can enter your passenger details similar to other online booking sites. The process for booking hotel stays through the ThankYou portal is very similar. To start, navigate back to the “Travel” screen and click on “Hotels“. Once again, the booking portal is easy to use and looks very similar to other online travel agencies. 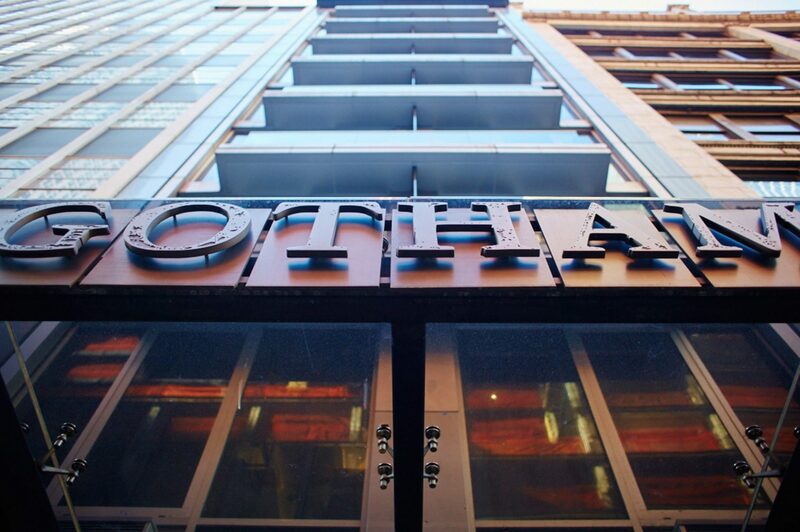 Enter your destination, dates, and number of adults and children and click on “Search Hotels“. 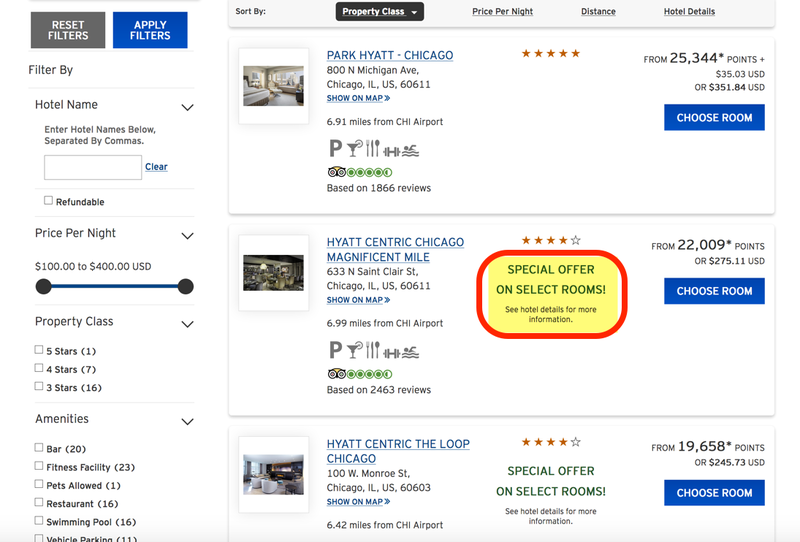 The hotel results screen will look very similar to the flight results, offering you a chance to filter by price range, amenities, or the hotel’s rating (in this case, from 3 to 5 stars). Sometimes, hotels will have special offers or discounts as well. If you’ve found a hotel you like, click “Choose Room” and decide if you want to book the cheapest room or splurge for a suite! Then, you can once again customize how many points you want to redeem (or you can redeem all of your points!) and choose to pay the rest of your stay in cash. Once you’ve picked a room, you’ll be taken to a checkout screen where you can enter your personal details. And always be careful to check the cancellation policy for your booking! Find the “Cars” tab under “Travel” and enter your pick-up and drop-off points, dates and times, and the driver’s age. The results list is similar to the flight and hotel search, with the least expensive presented first. You can filter by rental company, car type, and car options. 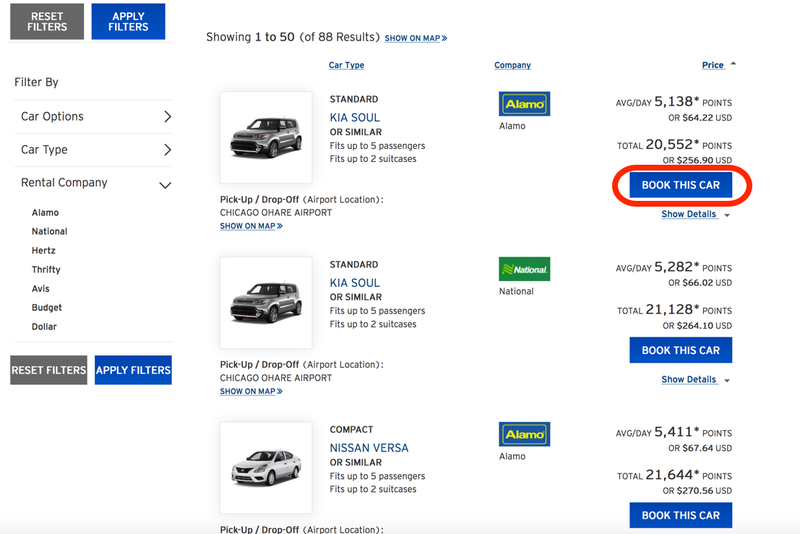 When you find the car you want, click “Book This Car“. Again, you can customize your payment options. And you’ll be brought to a similar screen to enter your personal details before you confirm the booking. 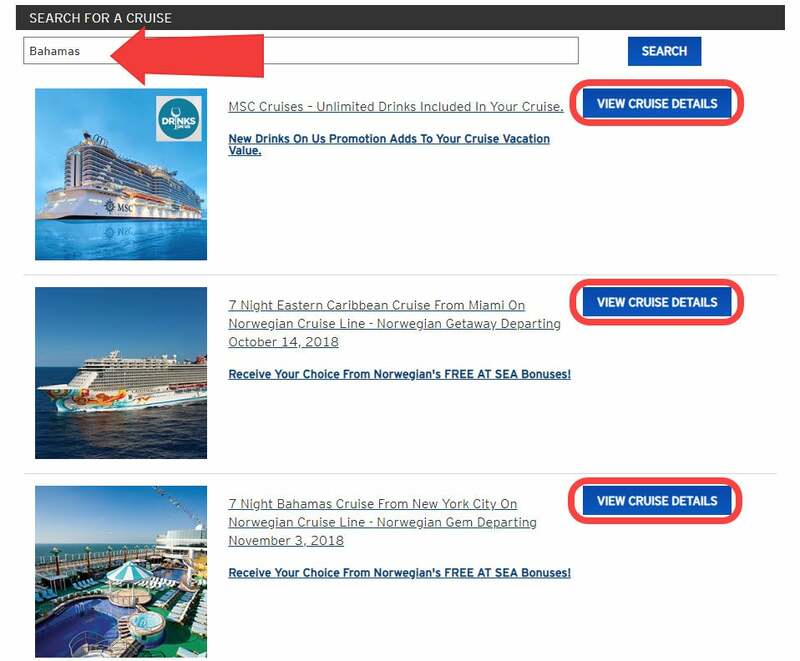 While you can browse for different cruise deals through the Citi ThankYou travel portal, you can NOT book them online. 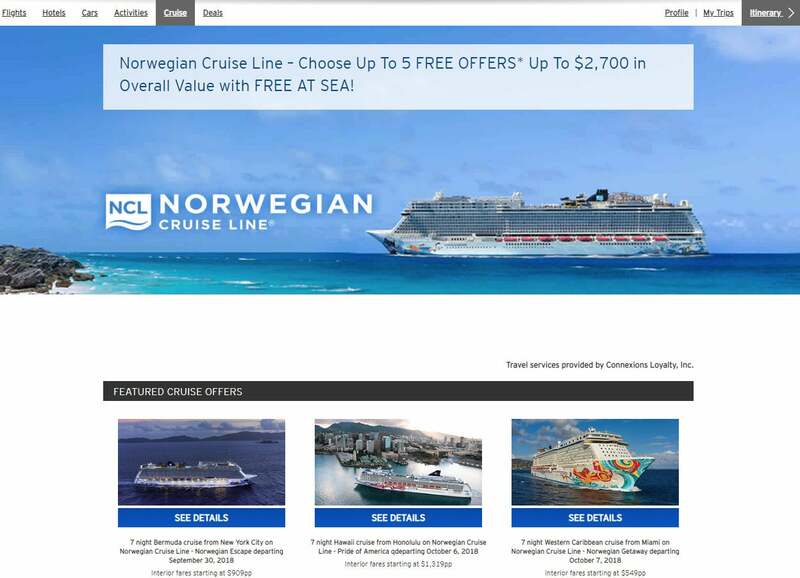 Find the “Cruise” tab to browse cruise offers and special deals. You’ll see featured cruise offers at the bottom of the screen. You Can Also Use Your Citi ThankYou Points to Book Cruises! 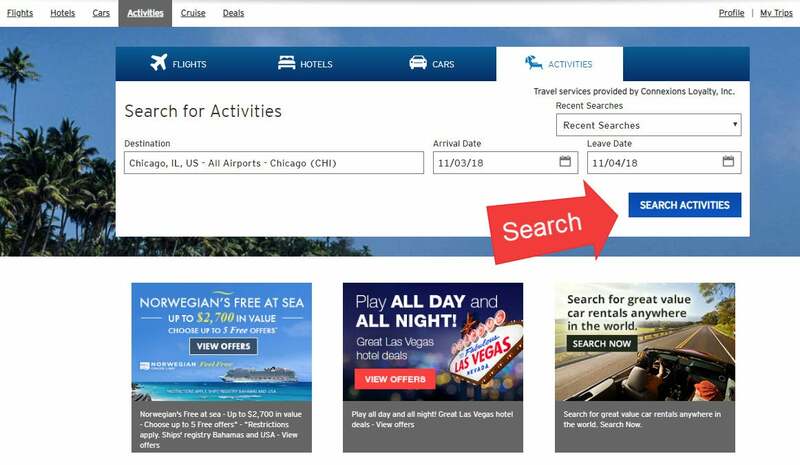 Unlike searching for flights, hotels, and cars, you can’t specify certain travel dates from the search screen. But you can specify a cruise line (like Norwegian) or destination (like the Bahamas). Then, you can click on “View Cruise Details” and decide if any of the cruises are a good fit! If you find a cruise you like, call Citi at 800-842-6596 to book. The “Activities” booking option is a little simpler from a booking perspective, because you can read the details of each specific activity and choose the one that works best for you or your family. To search for activities, just click the “Activities” heading and enter your desired destination and dates. 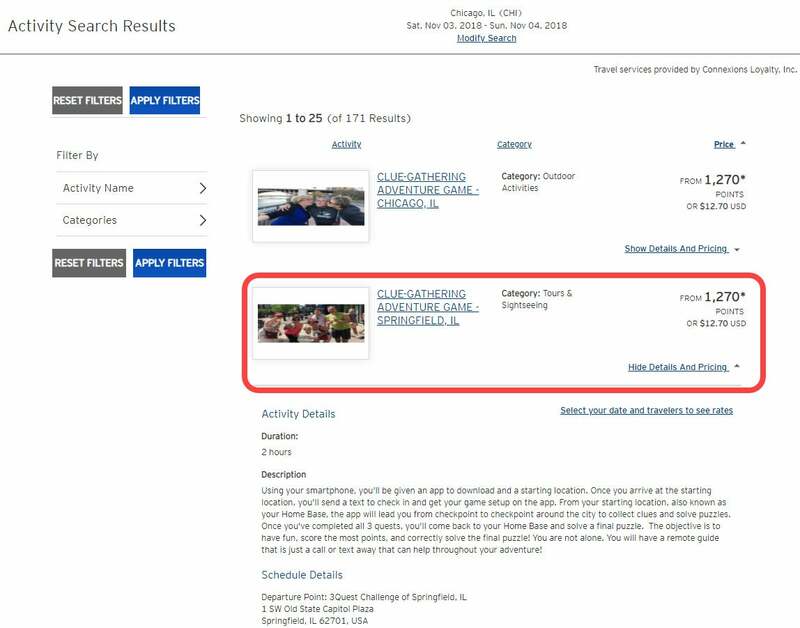 Search for Activities Across Multiple Dates to See What Events Are Happening! I like that the activities search tab will show you all available activities across a range of dates. This can be especially helpful for families or for folks who want to get to know an area, but don’t know what fun events might be offered. The results screen of your activities search will give you more details about each option and allow you to customize that date you want. My family recently booked a scavenger hunt in downtown Boise and had tons of fun getting to know the local area! Note: Even with the Citi ThankYou Premier, you’ll get a value of 1 cent per Citi ThankYou point when you book activities. Keep in mind that for any booking through the Citi ThankYou Portal, you can always call Citi at 800-842-6596 with any travel or booking related questions. In my experience the Thank You Rewards team is friendly and efficient, and sometimes calling in is even easier than booking online! If you prefer simplicity or don’t want to deal with blackout dates or searching for hard-to-find award flights, booking travel through the Citi ThankYou travel portal can be a very good deal. You can redeem points for flights, hotels, rental cars, cruises, and activities – and you’ll even earn frequent flyer miles for your flights! And now that the welcome bonus on the Citi ThankYou Premier card is the highest ever, it’s a good time to consider boosting your Citi ThankYou points balance. With the Citi ThankYou Premier, your points are worth 1.25 cents each towards airfare, hotels, rental cars, and cruises. And if you have the Citi Prestige (not available to new applicants), you can redeem points at 1.25 cents each for flights. In all other cases, your points are worth 1 cent each. Keep in mind, it’s possible to get more value from your points when you transfer them to airline partners. So always compare to see which is a better deal before you pull the trigger. What’s your favorite way to redeem points through the Citi ThankYou travel portal?